“ActionClip”, is a general purpose term for whatever is that can be added within a Cutscene within Tracks. Each track type though as seen later on, has a different set of ActionClip types that are available to be added to it, but some things may be found in common amongst different ActionClip types, which are best to described first before moving on with the rest of the documentation. Simply the properties of the clip in regards to when it starts and when it ends. Some few clips take effect immediately and always have a length of zero, like for example the Enable Actor Action Clip, which simply takes an instant to complete. You can change the setting in the inspector or easier within the editor. Most clips have Blend In and Blend Out properties. Generally speaking, these properties control how the clip blend in whatever is that it is doing, as well as how it blends out at doing nothing at all and having no effect. These properties can both be controlled within the clip’s inspector panel, as well as by holding down “Control” while dragging at the edges of the clip in the editor, considering that the clip is blendable in the first place. Some clips are also cross-blendable between one another, like for example animation clips. TIP: Sometimes, you may not want to blend out, but rather clamp the effect of the clip. This is easily done by simply setting the BlendOut property to zero. All clips naturally have at least some parameters to set. All clips that are requiring some kind of position have a special parameter like the one shown above, that allows you to either set the target position through a Transform reference, or directly through a Vector3. In most cases using a Vector3 is desirable, because it can be animated directly within the clip! (see bellow). Some clips have Animatable Parameters, which allow the clip to have embedded animation over it’s length similar to how it’s done in various animation software like Softimage, Maya, Cinema4D, or After Effects for some examples. For example, the target position of where the character is looking at, can be animated within the clip directly, which is naturally much more intuitive than having to have another Actor Group with a game object animated only for that purpose. Animatable Parameters, can be quickly recognized by their special GUI in the inspector. By default, all Animatable Parameters start as “not-animated”, and can be made “animated”, simply by creating the first keyframe by clicking the “key” icon next to that parameter. 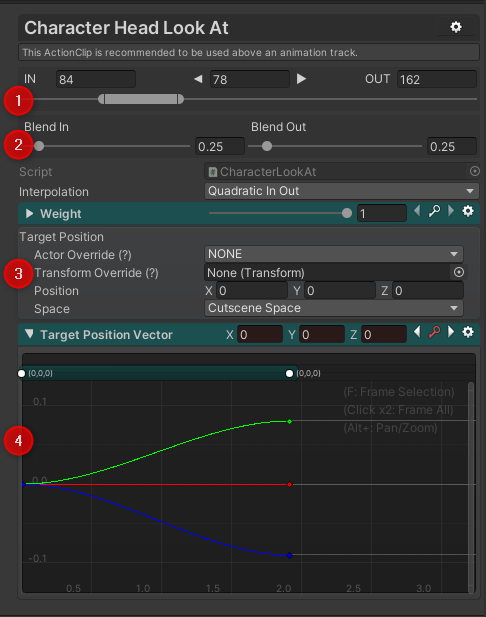 All Animatable Parameters that have at least one keyframe added to them, will be able to foldout for viewing and editing those keyframes and animation curves within the duration of the clip they belong, like shown above for the “Target Position Vector” parameter. All clips that have Animatable Parameters, will show a mini DopeSheet over their clip in the editor, which is very useful to easily manipulate the keys without the need to fallback into the inspector panel. Furthermore, clip Animatable Parameters can completely be edited inline with the Slate timeline instead of only through the clip’s inspector. To open the inline editor, simply click on the “curve” icon found next to the relevant track after having the clip selected. Animatable Parameter keys, can also be retimed easily by holding down the “Shift” key while scaling the clip, in contrary to not holding down shift, which only scales the clip without retiming the keys. Furthermore, when working with multiple clips, it’s good to remember that by holding down the “Shift” key while moving a clip, will also shift all clips in the same track after the clip that is being currently dragged, which is a very quick way to move a lot of clips to create some time space. But of course rect selecting clips between different tracks is also possible as well. Please note that the rect selection here is all inclusive, which means that only clips that are entirely within the rectangle are being selected. This is done by design to avoid time irrelevant clips being selected by accident, thus every clip that is actualy within the rectangle, is certain to be selected. Through the clip’s context menu, an option to “Stretch” the clip exists. This option will make the clip fit between neighbor clips. Clips can also be split at specified time through the context menu.